As we know, Xiaomi announced the MIUI 9 and also share the Release date and list of Supported devices. The Company already released the alpha and beta build of the software on Redmi Note 4X and Mi 6. We already provide the download links for the devices, but many users don’t know how to flash MIUI 9 Update on their device and looking for a flashing guide to Update their Xiaomi device to MIUI 9. That’s why we provide you the step by step guide to Install MIUI 9 ROM on Xiaomi Devices. This guide work on both Global and China build and on both alpha and beta build. Who already Download MIUI 9 ROM and looking for flashing procedure will follow below guide. There is two way to Install MIUI 9 ROM on Xiaomi Devices, one is Recovery mode, and other is fastboot mode method, here we discuss both. So check below How to Install MIUI 9 Update on Xiaomi Devices. It may erase your phone data, so we advise you first to take a complete backup of your phone and then proceed. The Fastboot method bootloader of some device needs to be unlocked. (Check How to Unlock Bootloader of Xiaomi Devices). 1) First, make sure your device running on latest MIUI 8 Version. 2) Download MIUI 9 ROM and save it on your device. 2) Now download MIUI 9 Fastboot ROM for your device. 7) First, click on the ‘Refresh‘ button (It will automatically recognize your device) and then click on the ‘Flash‘ button to flash MIUI 9 ROM on Xiaomi Devices. 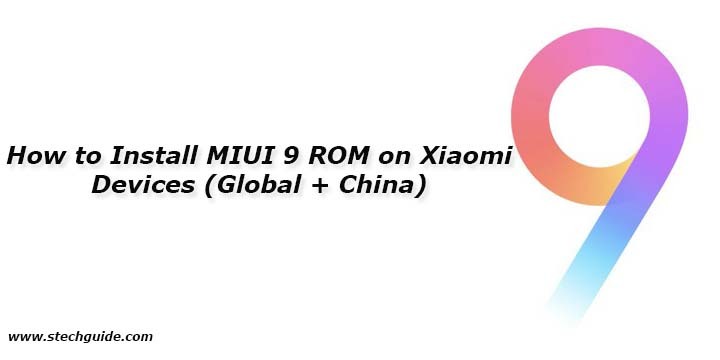 So this is the complete guide to Install MIUI 9 ROM on Xiaomi Devices. If you have any doubts comment below. Comment below if you have any doubts. Stay connected with us via Facebook, Twitter, and Google Plus to read more such helpful posts. You can use this method to Install MIUI 9 on Redmi Note 3 also. It is working for redmi pro global ?